Fighter jets tracking runaway Defense Department balloon over Pa.
LANCASTER, Pa. -- Action News has learned that several federal agencies are tracking an unmanned Defense Department balloon that is on the loose. NORAD says at 12:20 p.m. Wednesday the balloon, known as a Joint Land Attack Cruise Missile Defense Elevated Netted Sensor System (JLENS), broke free from its mooring station in Aberdeen, Maryland. The balloon is described at 37 meters in diameter and apparently looks like a blimp. A large cord is hanging from the balloon. The balloon travelled through the Lancaster area and was last reported to be in the skies over Lebanon County. Two F-16 Fighter jets from Atlantic City Air National Guard Base are monitoring the balloon, which NORAD says is holding at approximately 16,000 feet. FAA officials were working with the military to ensure air traffic safety in the area, and has referred all questions to NORAD. "JLENS is a supporting program of the Army and Joint Integrated Air and Missile Defense, providing persistent, over-the-horizon radar surveillance and fire control quality data on Army and Joint Networks. It enables protection from a wide variety of threats to include manned and unmanned aircraft, cruise missiles, and surface moving targets like swarming boats and tanks. 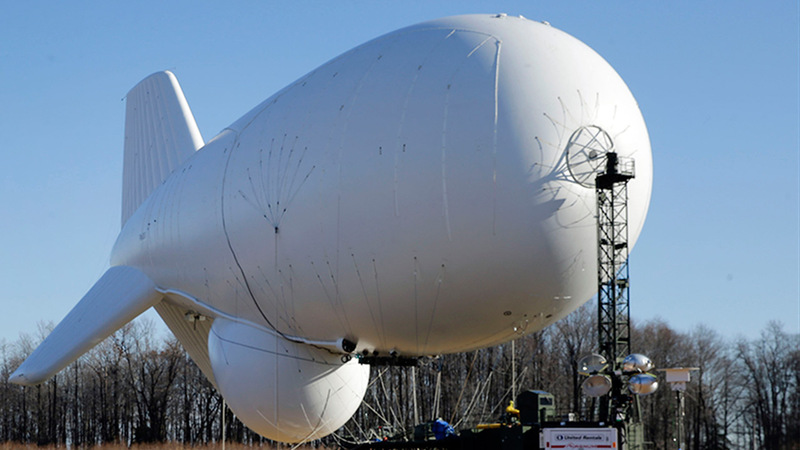 A JLENS system consists of two aerostats: a fire control radar system and a wide-area surveillance radar system. Each radar system employs a separate 74-meter (243 feet long) tethered aerostat, a mobile mooring station, radar and communications payloads, a processing station, and associated ground support equipment. The JLENS aerostat will fly at an altitude of up to 10,000 feet above sea level."